Carved eons ago by the Cache la Poudre River, the Poudre Canyon, north and west of Fort Collins, Colorado, has long been a favored recreation place, for fishing, hiking, camping, and more, of area residents and tourists. 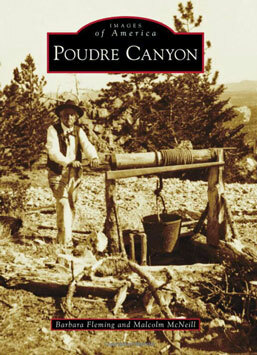 The canyon has many colorful tales to tell; this book takes readers on a drive through that history, milepost by milepost, stopping at historic places and taking some side trips along the way. Beginning with trappers and mountain men, the canyon has been traveled since the early 1800s, and Native Americans roamed here for times unknown before that. Explorers came, as did seekers of gold and silver. The expanding railroads resulted in logging enterprises, and mining interests brought about better access to mining towns. Near the end of the 19th century, tourists began to enjoy the hunting and fishing of the area. In 1920, the road, which had been blocked from either direction by a place in the canyon called the Narrows, finally went through all the way, bringing resorts and tourists.